This is a site map for curry and vegetable side dishes. Includes vegetable and lentil curries. Vegetable Recipes- Recipes for Vegetable Dishes. Kobichi bhaji - Cabbage / Gobi Subji - Serve with rice or roti. Kohlrabi - navalkol subji - Kohlrabi/Knolkol subji to accompany rice or roti. Bean Fry - Bean Subji - French Bean Subji to accompany rice or roti. Kohlrabi and Lentil Curry - Knolkol and Masoor(Red Lentil) Curry. How to cook beets - Easy way. Vegetable Stir fry - Quick Vegetable stir fry recipe. Curry Recipes - Tasty Curry Recipes. 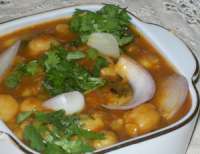 Chickpea Curry - Indian Chickpea Curry Recipe. Stuffed Eggplant curry - Stuffed Brinjal curry, Yenngai, Tumbid badnekai North Karnataka cuisine. Palak Paneer - Spinach and Cottage cheese Curry. Tomato Gojju Curry- Tomato and Onion Curry Recipe from South India. Onion Gojju - Onion Curry with Tamarind and Spices. 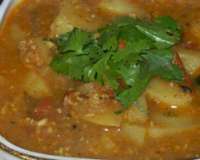 Potato Curry - Potato Curry as accompaniment for Roti, Poori, Paratha.